A very quick and easy way to limit the reach of a Tweet is to begin it with an @. we could see Everyone's @'s to Everyone. @DarinRMcClure are you ready for lunch? 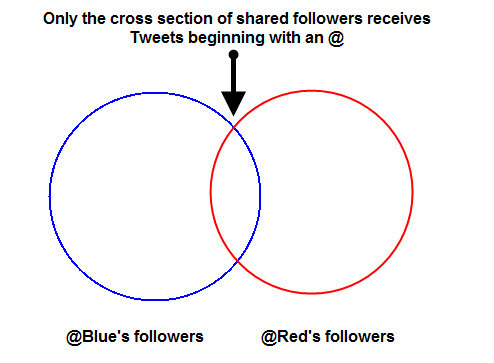 only our subset of shared friends will see that tweet beginning with an @. Hey @DarinRMcClure are you ready for lunch? or sometimes you may see a dot used for this very reason.
.@DarinRMcClure are you ready for lunch? In closing, you come to @Twitter to share and connect, do not limit that connection. Simple advise, but so "valuable" ... Thanks! I have to absolutely disagree with this. Especially the "never" part. I can understand doing this once in a while, but there is a very good reason why tweets work this way. If you were around in the early days, you got to see ALL the tweets from someone you followed, even "@" replies. The problem with this is that I don't *want* to see you having a conversation with someone I don't care about. It's spam at the very least, digital noise. The complaints of this were so overwhelming that Twitter found a perfect solution. @ replies would only go to the person with the @ reply, and anyone else that happens to be following both the sender and the person to whom the tweet was directed to. This is the best of both worlds and it keeps people from getting annoyed when two Tweeps/Twits go back and forth on a topic. So if you really wanted to see what Joe and Jill have to say to each other, you'd be following both. Of course, the best solution would be for all people to be curteous to their audience and move these "chats" to an appropriate medium... uhm, like instant messenger. But that in itself is a tall order. these venn diagrams are funny. I used to use them for my presentations back when I was working for my boss, now i am my own boss working from home selling import and export goods online..no more presentations!